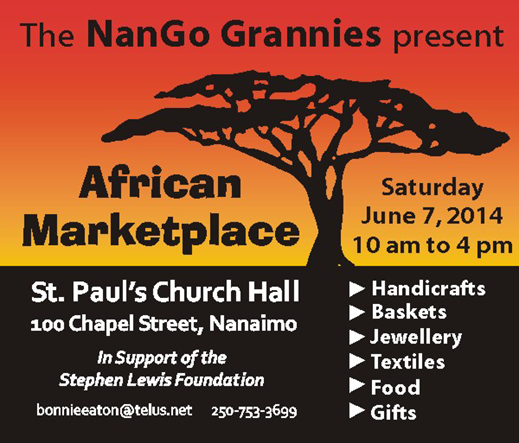 The African Marketplace is a fun event featuring fair trade handicrafts, baskets, textiles, books and jewellery from Africa and handmade items from Nanaimo’s NanGo Grannies and Oceanside Grandmothers. Take a break at the lunch and tea room. Learn about Grandmothers projects in Ethiopia and Rwanda from Paxie Vreede, a NanGo Granny recently returned from a Stephen Lewis Foundation sponsored tour. Come and have lunch with an African flavour and browse the many items for sale. It’s a great place for unique and meaningful gifts. There is something for everyone! All proceeds go to the Grandmothers to Grandmothers Campaign of the Stephen Lewis Foundation, and to fair trade enterprises in Africa. This entry was posted in upcoming events by oceansideg2g. Bookmark the permalink.